Choose the color of the navigation map and system menus. : Sets the color of the map screen. : Sets the color of the menu screens. 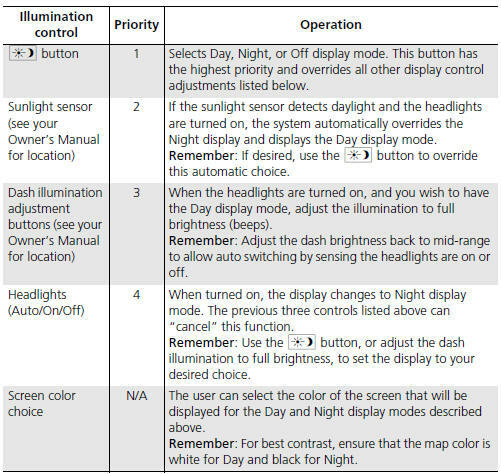 Set separate map colors for Day and Night modes. Select a color for the map screen. Set to White (factory default is Beige) to obtain the best daytime display contrast. Set to Black (factory default) to obtain the best nighttime display contrast. Set separate menu colors for Day and Night modes. Select a color for the menu screens. Set to Black (factory default is Blue) to obtain the best daytime display contrast. Set to Black (factory default is Blue) to obtain the best nighttime display contrast. (Display mode) button to cycle through the display modes (Day to Night to Off). ► The Brightness bar is displayed for a few seconds. 2. Press the button again. ► Repeat the procedure to switch the display modes. A visual guide helps you see the difference between Day and Night modes. • Select mid-range for the dash illumination. • Select White for the map Day display and Black for the map Night display.